I created this note card for personal use. I colored the heart foliage with markers. The purple ribbon was a thank you gift with an order from Ellen Hutson . Supplies: Stamps – Papertrey Ink, Stampin’ Up!, paper – Neenah Classic Crest Solar White, Stampin’ Up! 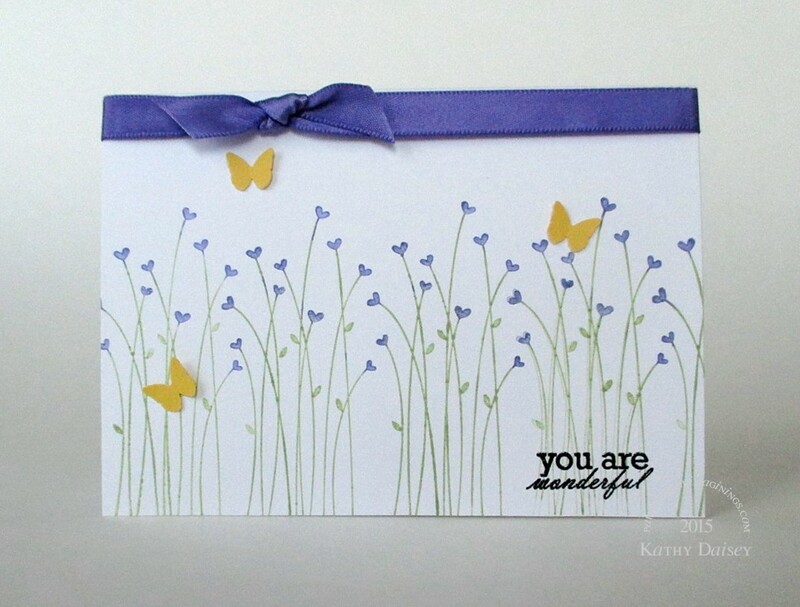 Daffodil Delight, inks – Stampin’ Up! Certainly Celery (retired), Lovely Lilac (retired), VersaFine Onyx Black, butterfly punch – Martha Stewart, embossing powder – Filigree Fine Art Powder clear, ribbon – Ellen Hutson. Categories: card, caring, encouragement, I love you, thinking of you | Tags: card, Martha Stewart, Neenah, Papertrey Ink, Stampin' Up! | Permalink. This is lovely. Would you make one for me?